Platycryptus undatus (Tan Jumping Spider). Size: approx. 7 mm. Photo: 07/26/14, 7 pm. Citing from wikipedia: "Like some other species of jumping spider, this species appears to exhibit curiosity towards humans who come into its visual field (jumping spiders all have very good vision.) It favors vertical surfaces such as fences, walls, etc. and because of its habits it is easily seen. It does not frantically flee humans and may be gently "herded" onto a hand, where it may make a thorough exploration and even jump from finger to finger. 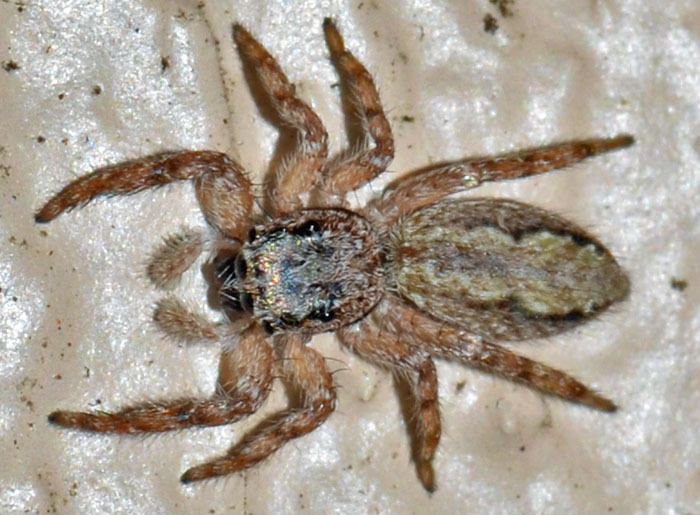 These spiders are not at all inclined to bite, but even though they are rather small they can deliver a defensive bite if they are pinched or squeezed."